Knitting up this wrap is quick with Aran weight yarn. I hope you’re enjoying our recent posts on our very new blog, KNITmuch! Glenna Harris and Michelle Nussey have done an awesome job at kicking it off in May! Let me tell you about a wrap I finished knitting up for myself in February. It has a lot of swagger – let me tell you how easy it is to change the yarn, change the project and knit a quick wrap with Aran weight yarn! 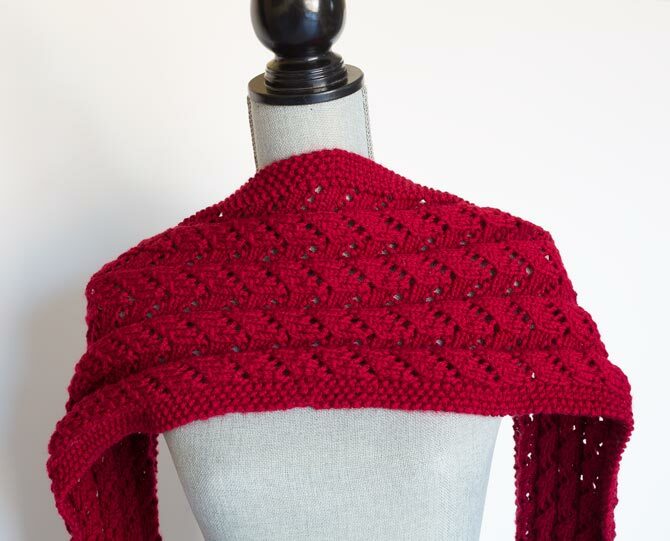 This scarf was inspired by the original pattern called Starlight Reversible Wrap designed by Elizabeth Fallone of Eliza’s Buttons and Yarns in Barrie, Ontario. Elizabeth designed it for A Needle Pulling Thread Festive 2012 issue. There are still some copies if you wish to get it. Although I wasn’t crazy about the yellow yarn she used, I loved the patterning instantly, and since I have a fascination for reversible scarves and wraps, it has been on my ‘to do’ list since then. The Starlight Reversible Wrap can also be worn as a scarf. The original wrap was knit up with fine DK yarn, similar to sock yarn. I wanted to make it using a rich red Aran weight yarn primarily to match my hat I knit up in January 2014. I cut the pattern repeat by half to get a similar width, and knit it up until I reached 2 meters. I love the results! I have a lot of fun changing the yarns to scarves and wraps, and experimenting. When you change the yarn you change the project! The Starlight Reversible Scarf in Aran weight yarn. The Starlight Reversible Wrap is not the kind of scarf you wear to do the groceries, unless you’re only going for a delicate loaf of bread! Perhaps I should change the name and call it Panache! It’s the kind of scarf you wear when you visit someone, and there may be a chill in the house, so you can use it as a wrap indoors, and wrap around your neck outdoors – it will keep you super warm. Walk slowly, let the wrap bounce, and show it off wherever you go. 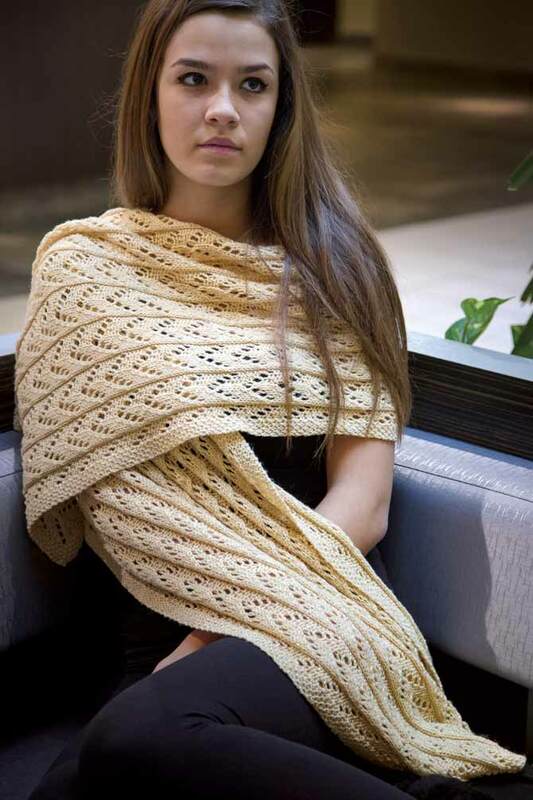 Because of the pattern elements, the wrap can stretch wide to 18″ or retract to 9″ if used as a scarf. 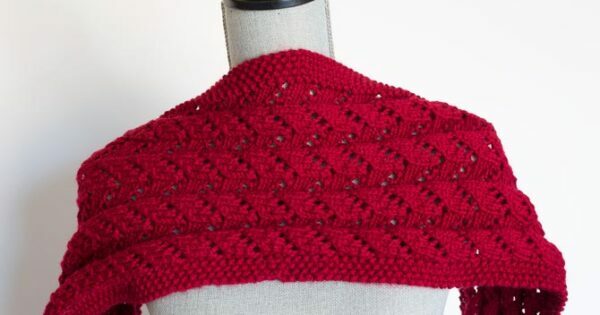 Most of all, it’s a wrap that has swagger, just by the pattern rendered bold by the red Aran weight yarn and the hard to miss ripples it makes when you use it as a scarf. For the ultimate cool style, wear your shades. Go ahead, try it! 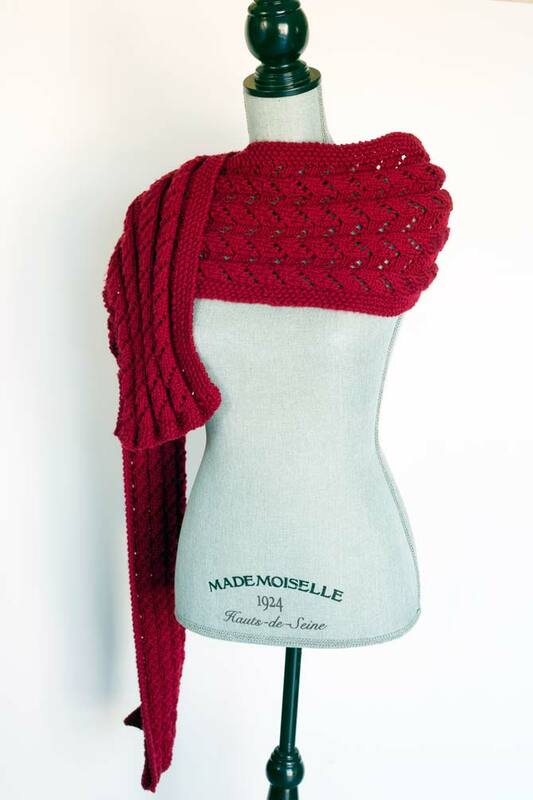 Knit a quick wrap with Aran weight yarn!